The fall weather we had on Tuesday was GREAT and we made the most of it. I've come to love living close to town and taking advantage of being able to walk places. Yesterday we took a nice long walk to the library and picked out some new books. When we got home the mail had been delivered so we sat on the step to read it. Jenna wanted to see the Parents magazine....good thing I had the camera out since this is not a posed picture at all! Dave had just come home from work and also got quite a kick out of her "lady-likeness". After dinner we headed outside and played some soccer. Jenna loves getting out her pink ball and going around and around trying to keep it away from us. 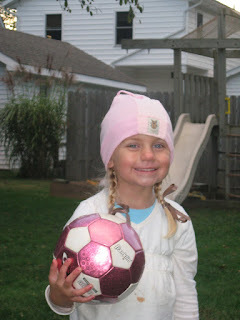 This is a girl playing soccer....ALL GIGGLES!!! She did this for a very long time which made bedtime easy. It's a little shaky, sorry. 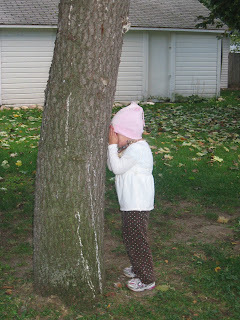 Then she decided she wanted to play hide and seek. 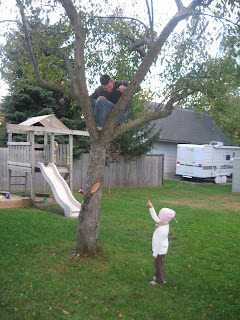 This is her "counting spot" while Dave and I hid. 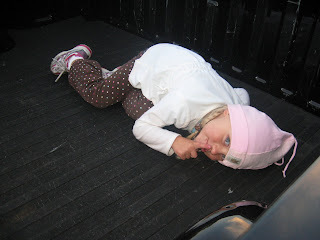 When it was her turn to hide I put her in the back of Dave's truck. She didn't want him to find her so this is her telling me to be quiet as I tried to take her picture in her great spot. I am laughing so hard I can hardly type! What a hoot! As always thanks for the good laugh! Jenna has her own little personality and it is so cute!